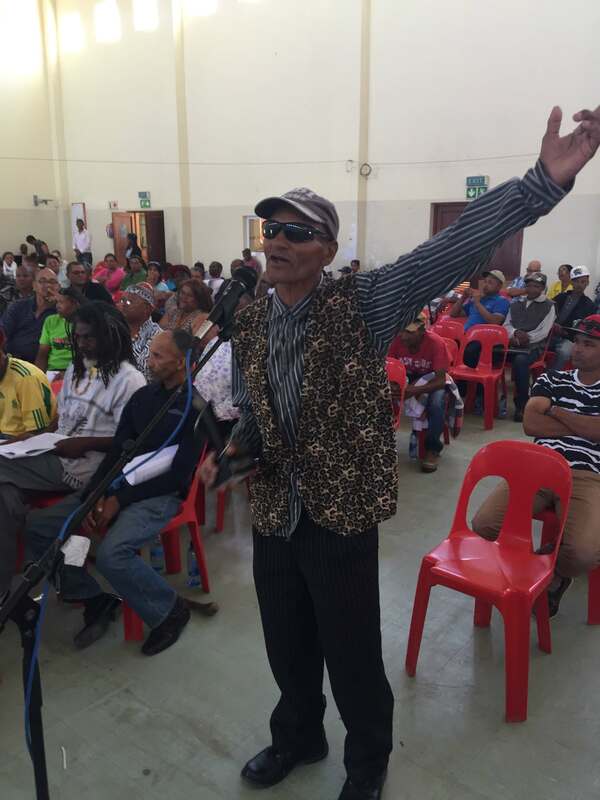 THE second round of public hearings on the Traditional and Khoi-San Leadership Bill (TKLB) wrapped up in Kokstad last Friday, 3 February, with many delegates wondering whether the parliamentary panel had been listening at all. After consistent criticism across the country of the way the Bill proposes to recognise and to treat traditional communities, the MPs sent to listen to ordinary people seemed to have heard only the rare statements of support. In a blistering statement after the final hearing, the Amadiba Crisis Committee described the parliamentary panel’s response as “a joke”. The support that was voiced came from some traditional leaders keen to see it enacted to secure their authority, and from some Khoi-San leaders relieved that their status is to be recognised at last. But many traditional leaders and most Khoi-San leaders voiced severe reservations about the TKLB. Criticisms were varied, ranging from the renewed imposition of tribal identities based purely on where one lives to the dilution of the role of families and villages in a system apparently built to please rural elites. After a long swing through North West, Northern Cape, Free State and KwaZulu-Natal, Richard Mdakane, the chairman of the Parliament’s portfolio committee on Cooperative Governance and Traditional Affairs, wrapped up with a summary suggesting general approval of the Bill. He promised that MPs would tweak the text in response to some criticisms, but did not acknowledge fundamental rejection of the powers the Bill proposes for provincial premiers, the arbitrary powers it would give to traditional leaders or the strong objections from Khoi-San leaders who wanted the TKLB to link recognition of their communities to land they could call their own. Nor did he respond to concerns about the management of community assets following the abysmal failure of oversight mechanisms built into the existing Traditional Leadership and Governance Framework Act of 2003. “Mr Mdakane wrapped it up like this: ‘All the places where we go, people agree!’ Then he said: ‘Everybody here agrees with the bill. You only want small changes!’,” the Amadiba Crisis Committee, from the Eastern Cape Xolobeni community, said in a statement after Friday’s hearing. “What a joke! But this is what he will report to parliament,” the statement said. The Amadiba Crisis Committee predicted that the long controversy over the provisions of the TKLB would have to be resolved in the Constitutional Court. Constance Mogale of the Alliance for Rural Democracy (ARD) attended nearly every hearing. After the Free State round, she spoke out about the quality of the arrangements and the content of the discussion. The TKLB was introduced in Parliament in September 2015, but public hearings were repeatedly delayed until late last year, when the first round was held in the Northern Cape, Western Cape and Eastern Cape. Hearings resumed in January and a third round is expected in parts of KwaZulu-Natal not already visited, in Mpumalanga and in Limpopo around March. Parliamentary officials visited areas where the hearings were held a few days in advance of each event, but appeared to have dealt mainly with logistical arrangements for people to get to the venues. And still many of those hoping to attend were left stranded at agreed pickup points. The Bill was not circulated before meetings, no translations were available before or at the hearings and communities were not given an opportunity to debate the proposals amongst themselves before reacting to it at the formal hearings. Many speakers complained that they were seeing the Bill for the first time on the day that they were expected to comment on it. The Alliance for Rural Democracy (ARD) did host several workshops for interested communities to discuss the Bill ahead of each event and arranged transport for small numbers of people to attend. In many areas, it was delegates who had attended ARD workshops who felt adequately informed to make substantive comments at the public hearings. The Land and Accountability Research Centre (LARC) at the University of Cape Town monitored all the hearings directly and organised a panel of monitors to attend each one to record how people were selected to attend and to summarise the questions and discussions. LARC’s analysis and factsheets on the TKLB helped communities to understand its implications for them. Live reporting on the @ruraldemocracy and @larcuct Twitter accounts under the #TKLB tag reflected the opposition voiced across the country to key provisions of the TKLB as well as the frustration of delegates promised transport that never arrived and at the lack of supporting documentation and translated summaries.